Chemicals are present in many workplace environments and are beneficial to helping industries succeed and grow. Reducing the amount of chemical storage can prevent inherent hazards associated with dangerous chemicals. However, when storing bulk chemical storage on-site, proper storage and handling procedures can reduce or eliminate potential risks. In this article, US Chemical Storage illustrates techniques for safely storing corrosive chemicals using corrosive storage lockers, while addressing personal protection and corrosive storage safety requirements. Read below to learn more. Corrosive chemicals present serious hazards to people and equipment; including poisoning, burning, deterioration and explosion. Injuries from corrosives can result from exposure in liquid, solid or gaseous forms. Ensure proper storage and handling techniques are implemented when dealing with corrosive chemicals. Typical corrosive storage considerations, regarding safety accessories, include climate control, ventilation, alarms, vapor detection, partition walls, and more. Corrosive storage lockers are essential to safely storing corrosive chemicals. Prior to storage, make sure Safety Data Sheets (SDS) are on hand for each type of chemical being stored. SDS can provide critical safety information including, chemical hazards, chemical properties, safe storage techniques and special handling procedures. Storing incompatible materials together could lead to violent reactions including a fire or explosion. When storing two types of corrosives, segregate acids and bases with solid partition walls to eliminate the possibility of a hazardous situation. Personnel who are handling, storing or transferring chemicals should always wear skin-protective clothing and eye wear. Equipment including acid-proof aprons, face shields, gloves, acid suits, safety shoes and other protective equipment should be used to protect workers from possible hazards. Corrosive storage lockers are constructed to compliantly store corrosive materials, while keeping personnel safe. Uniquely designed to be non-combustible or fire-rated and available in many different sizes to store small to large volumes of corrosive chemicals. 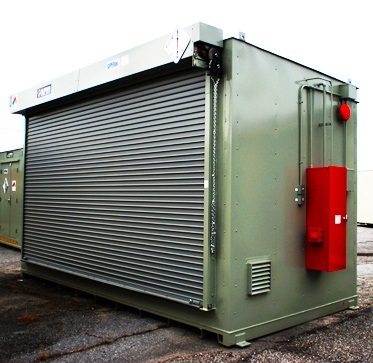 Corrosive storage lockers can be placed inside or outside of facilities to help increase operational efficiencies within manufacturing applications. Learn more about compliant corrosive storage lockers online or call 888-294-2729 to speak to a Sales Engineer for a free chemical storage consultation.